Joseph Victor Llorens, Sr., father of Frank D. Llorens Sr. and Grandfather of Frank D. Llorens, Jr. started out as a bartender in a saloon in downtown Atlanta. However, drawing sketches of the customers was more exciting to young Joe Llorens than drawing beer. One of those customers he sketched was F.C. Fisher, one of the early stained glass designers in the South. Mr. Fisher told Joe to have his father come to see him. A few days later when the elder Llorens stopped by to Meet Fisher in his studio, in the old Inman Building, they talked about young Joe’s talent and the importance of learning a craft one could pursue all his life. The father agreed to allow the artist to train his son. That was the beginning of an illustrious career for Joseph V. Llorens, Sr. He began as an apprentice just outlining the letters. Later he was taught how to design a cross and crown. A year later, when Fisher left, Joe, without a patron, went to work for the Empire Glass Company. There he learned all phases of his art and by 1912 he went into business for himself on Edgewood Avenue. Eventually he built his own studio and the rest is history. By the time Joseph Llorens, Sr. came along, competition was fierce, but people will invariably come to quality, and so they came to Joseph Llorens, Sr. Today his windows adorn thousands of churches and other buildings throughout the United States, the West Indies and Mexico. 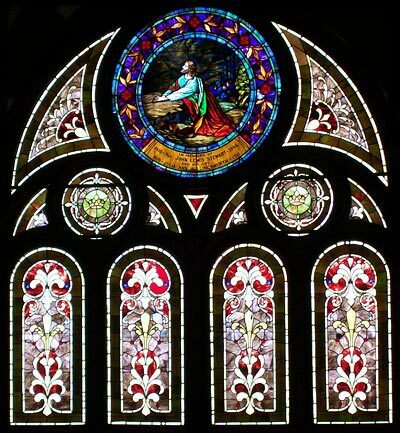 Joe designed and built his masterpiece which is the Ascension Window at the altar of the Peachtree Presbyterian Church in Atlanta, Georgia, which is pictured here. Joseph Llorens Sr. is also responsible for creating the three dimensional foreground for the Cyclorama’s Battle of Atlanta painting. The painting came alive when these extra dimensions were added. It was during the Depression and Mr. Llorens got a portion of the $6 million in WPA money to put hungry artists to work on the painting. He devised many original techniques in plaster, concrete, paint, earth and earth coloring. They made as many as six thousand plaster leaves for small shrubberies and hundreds of plaster figures and pieces of equipment. Frank D. Llorens, Sr., was born in Atlanta, Georgia in 1950 and since his graduation from school has been working in the field. Frank, Jr. joined the family business approximately 8 years ago. 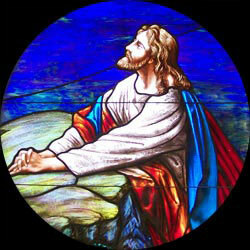 The history of our family is and always has been a love for the craft of stained and leaded glass. We continue to strive for perfection and remember all that Joe taught us about his love of this art form.